Young BMXers during a race. Setting BMX racing apart from cycling, it is an off-road type of bicycle racing which officially became a medal sport at the 2008 Summer Olympics. In New Zealand, the official organisation responsible for BMX in the country is Bicycle Motocross New Zealand (BMXNZ). Since then, Kiwi BMXers have been impressing the world as they sweep off their opponents from one competition to another with their BMX skills. Do you think your kids can preserve New Zealand's BMX legacy? Toddlers take on the BMX race track challenge. Is BMX racing for your kids? Whether it’s for recreation or for sport, cycling has always been a fun ride for kids and adults. Having control over speed is probably one of the most liberating experiences. It’s probably one of the reasons why a simple neighbourhood biking eventually became mountain biking, which then gave birth to BMX racing. Just like city driving to Formula 1, cycling to BMX racing is both a hobby and a sport to adrenaline and speed junkies who have been championing rough slopes and racing tracks. Unlike ordinary bicycles, BMX bikes are strong, quick-handling, lightweight derivatives of the standard 20-inch wheels. BMX racing tracks usually have a starting gate for up to eight racers, a groomed, serpentine, dirt race course made of various jumps, rollers, and a finish line. Given the circumstances, BMX riding does not only require balance. It requires a lot of time and hard work for skills training. BMX racing is one of the most sought-after activities for kids. BMX games in New Zealand are strongly perceived as the stepping stone for future BMX world champions. If you think BMX racing is a promising sport for your kids, visit ActiveActivities directory for more information. Get your kids to start BMX racing! Not sure if BMX racing is for your kids? Suffice to say, kids as young as three years of age can already start training for BMX games. Of course, there are some risks in BMX racing for kids, but which activity or sport does not pose any risk? The best way to minimise the risks in BMX racing is to make sure that your kids are physically and mentally prepared for an exhilarating BMX challenge. Add to that the BMX racing equipment that is required for your kids’ safety. Just like other kids activities, parents or guardians must always supervise children. 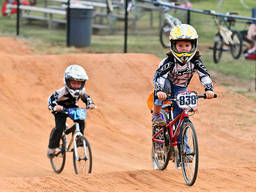 Even if you enrol your kids in BMX racing clubs, your participation in their day-to-day or weekly training is required. Before you think about getting your kids into something, you must be sure that you can commit yourself to full supervision. What BMX racing gear do your kids need? Buying equipment online may be convenient for you, but for the sake of your kids’ safety, make sure that you buy BMX racing equipment from bike stores. Why? First of all, you need to make sure that you buy the right size and the best quality for your kids. Obviously, you are not going to buy something that is one size smaller for your kids, but you may unintentionally or intentionally buy something that is one or two sizes bigger. The importance of a perfect size bike, equipment, or body gear is equivalent to the importance of a first aid kit. Never take chances with leaving your first aid kit at home because someone else “might” be carrying around a first aid kit that you can borrow. To learn more about BMX racing and other bikes and cycling activities for kids, check out ActiveActivities directory today. Your commitment to your kids’ talents and skills represents their success in BMX racing. Like fellow parents, BMX champions today believe that there is a lot of talent among little BMXers, and they, too, believe that our young Kiwi riders can bag more gold and become future BMX champions!